You may be familiar with the smaller, outlying islands of the Bahamas that are accessible only as part of a cruise package. CocoCay (sometime written as 2 separate words i.e. 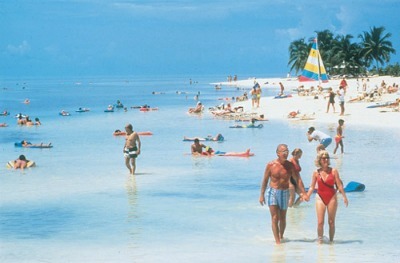 Coco Cay) is one of the most beautiful such islands. This amazing getaway destination is reachable via Royal Caribbean Cruise Lines (Celebrity is another cruise brand under RCCL), which operates all of the facilities onshore. There is nothing quite like the feeling that you have arrived at your very own private paradise, far from the congestion of the tourist resorts and the frenzied pace of the cities and towns. A truly fantastic vacation spot, Coco Cay means relaxation, fun in the sun, excellent beaches and plenty of long strolls in the welcoming tropical breeze. Visitors arriving on a Royal Caribbean or Celebrity cruise ship will be transported via private tender vessel directly to the main beach area, where one finds the food pavilion, souvenir shops and excursion headquarters. The ship remains anchored in the bay, and because there is usually only one cruise liner calling on this island at any given time, the transport from ship to shore is very quick. In Coco Cay there are plenty of beach areas, hiking trails and overlooks that offer excellent views of the surrounding ocean. Walking trails lead from the food pavilion area to various other beach locations where visitors find hammocks, open air shelters, picnic tables and of course a great number of inflatable boats waiting for adventure. The Caylanas Aqua Park is a floating garden of pools, botanical delights and swimming holes, and is perfect for both couples and families with small children. The beach volleyball courts are very modern and well maintained. There is a licensed, professional snorkeling instruction service on the beach as well, offering tourists the opportunity to try their hand at this sport in the sheltered, green waters of the bay. Another popular activity at Coco Cay is off-road adventure for the little ones, with mini mustangs, tiny model Jeeps and even pink Barbie Escalades available for the kids to drive. The souvenir shops are operated by licensed companies and offer straw hats, sunglasses, popular clothing designed in the region, and everything from cups, mugs, pins and bolo ties. Like most of the private islands in the Caribbean, Coco Cay has a large food pavilion court that serves up such fine entrees as fresh fish, barbeque beef and pork, soups, salads and refreshing cocktails. There is no charge for the meals on this island as the cost is included in the price of the cruise trip. Walking is the only form of transportation needed, as the activities are near the pavilion and on the nearby secluded beaches. The trails are rather short and there is no need to worry about getting lost, as all destinations are clearly marked with signs. 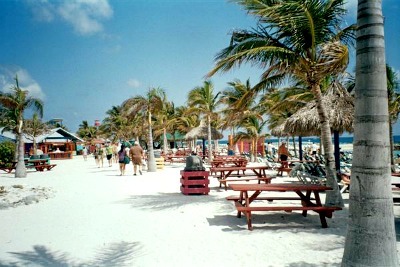 Money is not needed on Coco Cay except to buy souvenirs or to gain access to the Aqua Park. U.S. Dollar is accepted at the gift shops. The island has no modern telephone service, and emergency communications must be made on board ship. Cruise travelers having a great time on Coco Cay beach. The picnic area. A bit far on the left you can see the food pavilion. CocoCay is a great place for snorkeling. 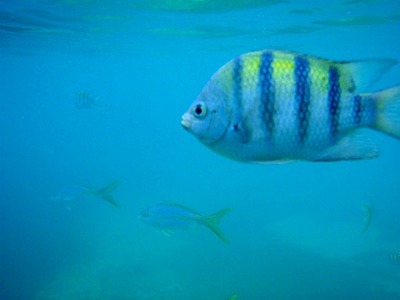 You can see a lot of beautiful fish in the ocean. Yet another scene on this amazing island. Cayole offers 100% best price guarantee on all cruise purchases.